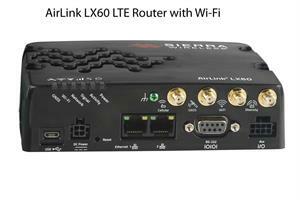 Wireless Phone Gallery strengthens product portfolio with the addition of the New Essential Series AirLink LX60 Routers by Sierra Wireless. The innovative, new product series opens-up additional markets for secure, managed connectivity for IoT applications, including retail, building automation, digital signage, taxis, ATMs, kiosks, and point-of-sale terminals. Sierra Wireless has just announced their new AirLink Essential series of routers and gateways, The industry's first cloud-managed Low Power Wide Area (LPWA) cellular router. AirLink LX60 router comes in LTE Cat 4 regional variants, and a Global LPWA (Low-Power Wide Area) variant offering LTE-M/NB-IoT for applications where low data rates, enhanced cellular coverage and global deployment is required. It is purpose-built, providing LTE connectivity out of the box, combined with trusted AirLink networking, routing and security. Sierra Wireless also provides a complete portfolio of AirLink Network Management tools, available in the cloud or on-premises, for remote monitoring, configuration and control of all connected AirLink routers and gateways. With AirLink LX60, businesses can rapidly and confidently deploy high-volume IoT applications that easily scale from tens, to tens of thousands of networking devices. The AirLink LX60 also enables IoT edge programmability, supporting the field-proven ALEOS Application Framework for custom applications, as well as tightly integrated cloud services and APIs. These features, combined with LTE-M/NB-IoT connectivity and a rich set of I/O options for data acquisition and sensor aggregation, enable critical data to be processed at the edge to drive application insight and create event-driven situational awareness. LTE-M/NB-IoT support also provides 5 to 10X enhanced coverage in remote locations and inside buildings, while reducing ongoing airtime costs by up to 60 percent. LX60 is available with optional Wi-Fi + GNSS and rated for shock, vibration and vehicle power environments meeting the demands of light commercial and taxis requiring connectivity. Pricing & Availability. AirLink LX60 models are priced at $449 for LTE-M/NB-IoT, $499 for LTE Cat-4 and $569 for LTE Cat-4 with Wi-Fi and GNSS. LX60 LTE Cat-4 variants are sampling now with commercial availability beginning in April 2018. LX60 LTE-M/NB-IoT samples will be available in May 2018.